Jewelry makes a fantastic gift idea for the lovely lady in your life… after all diamonds are a girl’s best friend, right? Browse our favorite jewelry gifts that fit every budget to find the perfect piece for your wife or girlfriend! Your love will appreciate receiving pieces such as a ring, earrings, a bracelet or necklace for their birthday, the holidays, your anniversary, Valentine’s day or just because. If the upcoming occasion is her birthday, the sterling birthstone cuff featuring her particular birthstone is an exceptional gift that she can wear daily to remind her just how much you love her. The “love knot” symbol represents strength and love so jewelry with the symbol such as this love knot ring is a wonderful anniversary gift to let her know the strength of your love for her. Jewelry items engraved with monograms are super trendy popular these days and having something personalized just for her shows her just how much she means to you. She’s sure to fall in love with a customized piece of jewelry just for her such as a monogram necklace , monogram stacking rings or a Sterling Silver Personalized Monogram Bracelet . 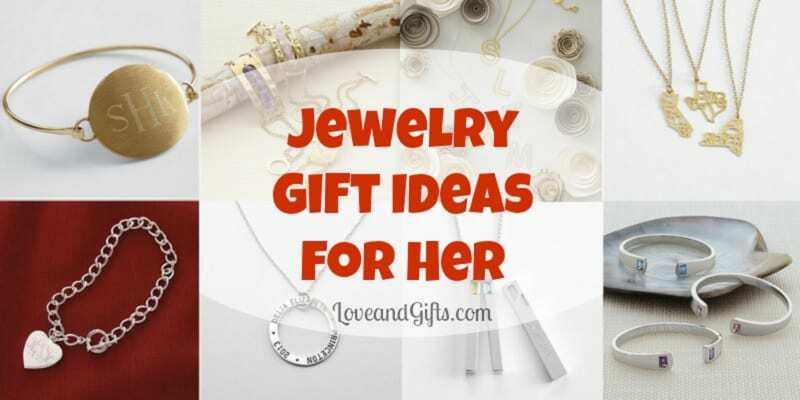 Whether it’s her birthday, your anniversary or Valentine’s day be sure to get your lady a jewelry gift you actually put a little thought in to and remember that a little detail can go a long way. Pay attention to the kinds of things she likes and prefers in order to pick out the perfect gift for her. For instance, if she doesn’t have her ears pierced, don’t get her earrings! Also take in to consideration whether she prefers gold or silver jewelry. When in doubt, give her jewelry. Every girl loves a little bling! Though there are many affordable jewelry gift options, beware of giving expensive jewelry early in a courtship. It’s best to be sure both of you are truly invested in the relationship before you make that kind of investment. Looking for more gift ideas for your sweetheart? Check out our Bath & Body Gift Ideas for Her and these Home & Kitchen Gift Ideas for Her!